These were the earliest systems, and there were various incarnations of transmitters (throttle, cab) and receivers. There an "onboard" system, and several versions of "trackside" systems. The onboard system did NOT use the socket, and was intended to be placed in a locomotive. You then ran constant power to the rails to power the system, although battery power would work also. The onboard system had an output capability of 2-1/2 amps. These are very hard to find nowadays and were not very successful, not enough current capability and not very good range. The trackside systems were much larger and intended to run an entire layout attached to the rails, so all locos on the layout would be controlled from this unit. Thus, the locomotives were unmodified. If the trackside unit was removed from it's case, it could be squeezed into a boxcar, or large loco, and this was done often, since the onboard unit had a limited power output. There were 2 variations, the original one with a metal case at 4 amps and the later ones with a plastic case at 10 amps. The throttles also came in various capabilities over the years. There were 5 different models. The first ones were made in Korea, and had 2 channels. There were 2 variations on the 2 channel ones, one with programmable jumpers, one without. Then there came the 10 channel, 10 frequency transmitters, in 3 different versions. All 27 MHz systems are one-way communications only, i.e. there was no feedback from the loco or acknowledgement or confirmation a command had been received. There were various receivers, and all but one of them were the "Trackside" style, i.e. designed to sit by the track side, and connect the output to the rails. There is one "on board" receiver, short lived, worked ok. The rest are sizeable metal or plastic boxes with different outputs. This was the first "on board" receiver, designed to fit into a loco. It is no longer manufactured. The output is specified at 2-1/2 amps. This system did not plug into the Aristo socket, and pre-dated the use of the socket. It was good for about 2.5 amps. Range was OK, and the metal housing helped ruggedize it. It was not particularly popular, due to the limited range (you need a long wire antenna at this frequency) and the limited current capability was an issue. The first "Trackside" receiver, designed to drive the rails, not reside in a loco. No longer manufactured. These units were spec'd at 4 amps. This was the earliest model and the first obsoleted. No linear/pwm switch. Apparently 4 amps was optimistic, and 3 amps was more common. They were 2 "track" (2 channel). There were apparently 2 versions of the metal receiver. The first/earliest units were made in Korea. 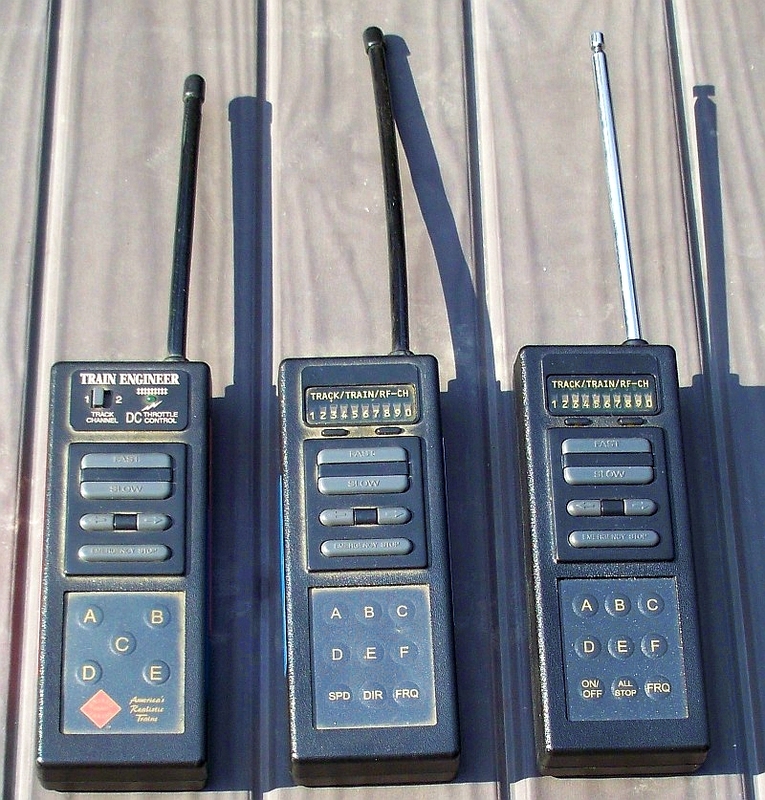 The images below (courtesy Dan Pierce) show a 2nd and later version unit, made in China. The code switch must be set to match the code switch in the transmitter. (The transmitter has a similar code switch inside.) The Korean transmitters will not work with this unit. There is a system with the receiver intended to be "trackside", i.e. between your power supply and the track. Thus, you can run one train per track/electrical block. The Basic TE has only one frequency. Apparently there were 10 different frequencies available for purchase, so if you could get one of each, you could have independent control of 10 locos, but you need 10 different controllers. They came with a 1 amp, 15v wall wart transformer. I believe these units were orange plastic cases and an orange transmitter. These were not digital and any other 27 MHz system tended to interfere with it's operation. There also seemed to be a 2 channel version, and it seems that these in metal frames will "pass" more output voltage than the later units, rated for 10 amps, or at least had a 10 amp fuse. Dan Pierce reports they would not do over 4 amps, and output voltage started dropping at 3.5 amps. There was a linear/pwc switch. There also seems to be 2 different versions of this 2 channel TE, one made in Korea, and the other most likely made in China. Dan Pierce reports that the transmitters were not interchangeble. This overview is for the used units you can find on the market, again no longer manufactured with the advent of the 2.4 GHz Revolution. Aristo made a large unit designed to be "Trackside", i.e. is powered from DC, and the output goes to the rails. Some people have removed these from their cases and put in a boxcar, and powered from constant DC track power or batteries. There have been several versions, noteably a metal cased one and a plastic cased one. The 27 mhz "Trackside" metal receiver is 4 amps and plastic receiver is 10 amps, but needs a fan over 3 amps. Some of the "plastic cased" units have a "linear / PWC" switch, which means they can put out pure DC that varies in voltage, or the PWC mode, which is Aristo's name for PWM, pulse width modulation, which is used by virtually all modern drive systems. I'm not sure if there were units that only worked with 2 channel transmitters. There's a big advantage using DC mode if you have a sound unit designed for DC power, like the SoundTraxx Sierra, or others. These are rugged, troublefree units. Note that the specification of 10 amps was only available in "PWC" (pulse width modulation) mode. Analog mode was limited to 8 amps. There were 2 different ways that the electrical connections to a fan were provided. Note that it seems that the fan used is a 24 volt fan, and the power supplied is 12 volts, which makes sense, no need for a full speed muffin fan that large. The oldest version has an external terminal for the fan, the newer models have an internal 2 pin connector for the fan. Apparently there were about 3 versions of the plastic cased receiver. There were 5 different transmitters. The first units, (made in Korea initially) were 2 channel, one with programming jumpers inside, the second one did not have them. In 2005, the ON/OFF button replaced the previous "SPD" button, and the "ALL STOP" button replaced the "DIR" button. When on, the the on/off button will illuminate a red or green led (indicating th ebatteries are good. If no button is pushed on the transmitter for 10 minutes, the transmitter will turn off. The "all stop" button works similarly to the emergency stop button, except the all stop button sends the stop command to all 10 track channels on the current frequency. The emergency stop only sends the stop command to the current track channel. You can also set the unit to one of 10 different frequencies, so with 10 frequencies, and 10 "tracks" so you could theoretically run 100 locomotive. There were older transmitters that only had 2 "tracks". from the box: 27 MHz band, antenna input power 100 mw, spurious power up to 55 db, rf bandwidth 55 db at +-10 KHz max (deviation), modulation FM (code type). current 100mW typical. It uses 4 AA batteries. Aristo made several flavors of accessory controllers that had their own receiver inside. In general they were not very reliable, and did not have long range reception. Some did work well, and could be tuned to better receive signals. The 5472 / 55472 was a set of relays that plugged into a DIN connector on the early trackside TE's. This is out of production, although you could wire one into a current TE if you knew where to connect. 5474 / 55474 is an accessory controller / receiver for 27 MHz. 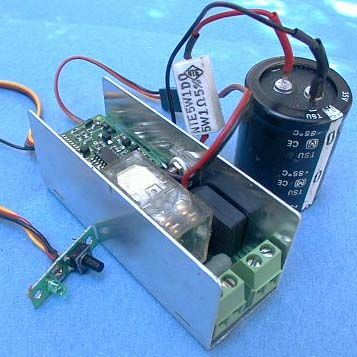 It is a standalone box that takes 5-16 volts to power, and it has the receiver and electronics for control. I made a small R/C add-on for Nick Savatgy. He often takes a trackside TE and runs locos with QSI modules at shows. The idea is to make little remote add on to do the track polarity reversals to ring the bell and blow the whistle. In short, there are 5 "outputs" on the unit. Outputs A and B are for switch machines, they appear to be capacitor discharge and put out a DC pulse, and reverse polarity each time they are toggled. Output C is for lamps, puts out voltage on or off, toggled by pressing the button. Instructions say 200 ma, but George found that an internal current limiting resistor will overheat at that current, keep to 100 ma max. This output supplies power. The + is plus and C is pulled to ground when activated. Note that outputs A, B, and C are not isolated from each other, so do not cross connect between them. Outputs D and E are connected to optoisolators where C must be positive with respect to the E terminal. They go to a low resistance state as long as the D or E buttons are depressed. George indicates these are probably only good for 10 ma! (These are the two I will use for the reversing relays). Theoretically, you could link the controller just like the main TE receiver, and support 100 controllers. It turns out that this accessory controller only works on some combinations of track and frequency. I got mine to work on track 1, freq 1, and track 8, freq 1 also. Dan Pierce reports that he has had success on track 1 and track 2 (freq 1). The manual states only frequency 1 works, but frequency 0 might work also. On these units, a "clean" DC supply is necessary for programming, and at or above 14 volts (I have validated they are flakey around 12). Note that the unit has a diode bridge on the input, so it can be powered from AC or DC. This is very similar to the 5474 / 55474 accessory controller, but all 5 outputs (A through E) are for switch machines. You connect 5 switch machines to it. It has a "pulse" type output, so it is not appropriate for the stall type motors, or the new Aristo slow motion switch machine. There is a goofy mode that lets you trigger more than one at a time, but it only allows A&B, or D&E or all 5 at once. Goofy. The 5475 has the same track and frequency limitations as the 5474 above. About lights flashing on the accessory receiver, George told me: "I have mine set up for double press operation. When I press a letter key, the green on the selected RX LED flashes rapidly. At the 2nd press, the LED comes on solid for a part of a second." I made a simple circuit with 3 relays and a couple of one-shots to control 3 sounds on the QSI, by reversing the track polarity. (This works on DC mode of the QSI). I used an accessory receiver, and used a momentary output (short horn/whistle), a toggled output (horn/whistle on/off) and a momentary output with a one shot to make the proper duration to start/stop the bell. Parts cost (all from Radio Shack) about $57 total. Anyway for a 5470, "abridged" instructions are below. There are differences in the models, but IIRC, the programming is basically the same and this should get you through. 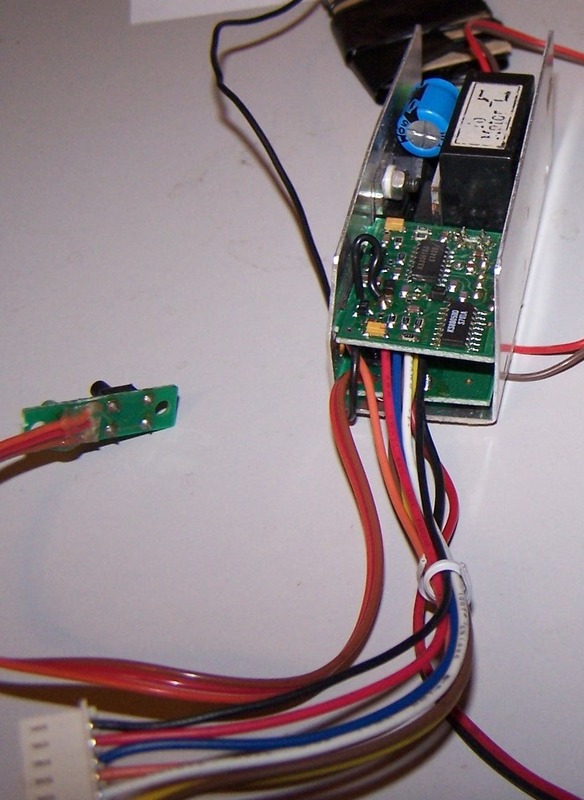 (1) (On receiver) Turn on power supply and make sure switch on rear of unit is on. Keep transmitter and receiver at least 2 feet apart. To select the radio frequency, press the FRQ button and hold it down for 2 seconds. At that time the light will begin to flash at the present frequency location number (1-10). Press FRQ again to select the desired frequency. The light will move to the right. Release the button at the desired frequency. Press any other button or simply wait for light to extinguish to select that frequency. Press the "C-L" button. A light will begin to flash at the present channel number (1-10). Press the button again to move to the right in order to select the desired channel. (4) (On receiver) Press and code set button for 2 seconds. The code signal light beside the code set button will turn on. (5) (On transmitter) Press a button "A" - "E" on the keypad immediately. Wait for the code signal light to flash, then release the button, and press another button "A" - "E". The light should go off. The first button (i.e., A-E) sets the momentum with the lower letter having less momentum. The second button (i.e., A-E) determines the time delay when changing direction with the lower letter having less delay. NOTE THAT ON THE SERIES 2000 Rev A, pressing the "A" button removes the monentum entirely. The TRACK # does not change the frequency. This is a list for the "Black" transmitter. Also, the "basic" transmitters in orange were available in the same frequencies.